“What’s behind what’s in front of you” – what an interesting concept – describing not only doors but also the art of photography. As we press the shutter to capture an instant, are we not working to express our idea of what the scene tells us; what it makes us feel, what’s “behind” the image? Are we not hoping that the viewer will be drawn into the scene just as we were? Each of us brings his or her own experiences to an image, whether we are creating it or studying it. The best photographs focus on that which drew us in the first place. In my opening image, for example, it was the person behind the door that drew my attention. Although the doors look like they could tell a million stories, for me the real questions revolved around the young woman – what was she studying/reading? Was she tired, absorbed in a story while waiting for the next load, bored? Why had she left the doors ajar in the first place? Have you ever thought about what drew you to a particular scene, painting or photograph? In my second image it was the boxes of fruit and the empty ticket booth that caught my eye. The booth reminded me of those old-fashioned amusement park booths with a fortune teller inside – a bit spooky and forlorn. The contrast of the fresh fruit beside it told me there was life nearby waiting to be savored. 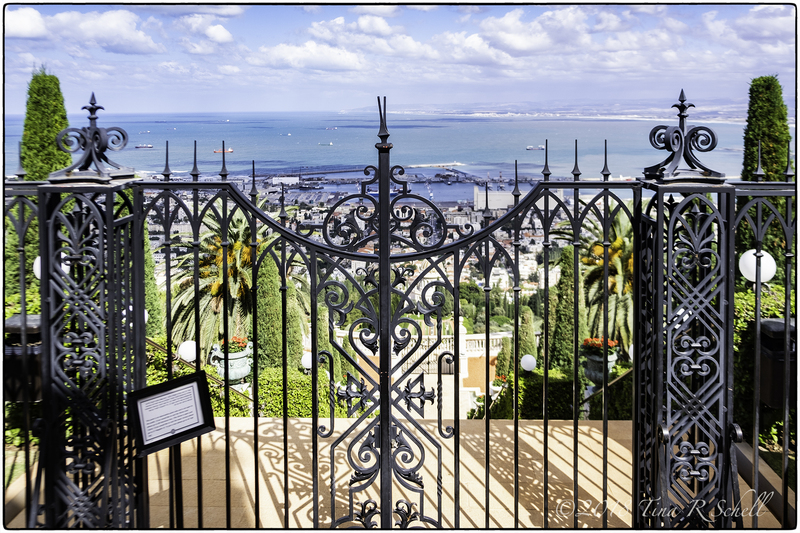 In the image above It was the shadows of the iron gate leading out to the beautiful blues of the sea and sky beyond. Often our eye is drawn by our subconscious but as photographers or viewers, it’s a great exercise to analyze what appeals to us and draws us in. I’m a fan of a bit of mystery in an image – everyone loves surprises, right? 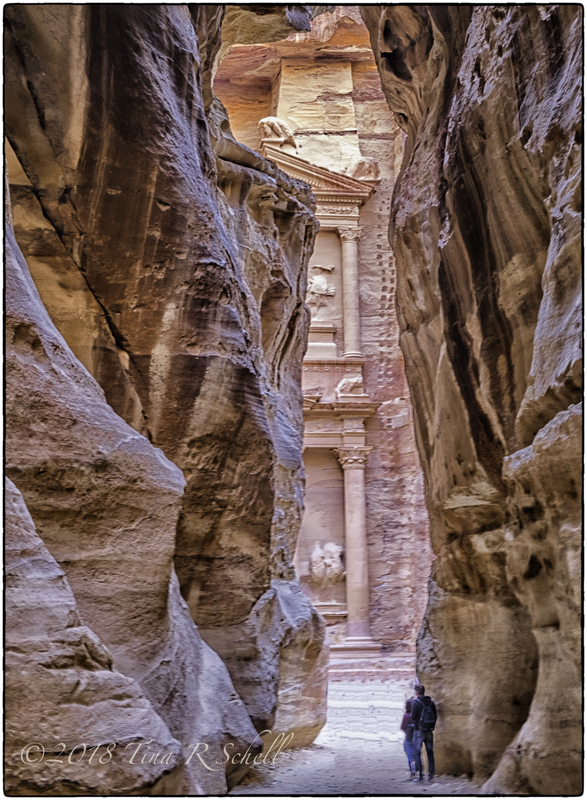 In the image above, for example, like everyone else who has been to Petra I found the famous Treasury Building to be spectacular. Having seen so many images of it in its entirety, I personally preferred the image above. I liked having just a taste of the structure’s splendor from the natural portal created by the rock walls of the Siq, and the thought of the two onlookers seeing the scene for the first time. And yes, of course I also made an image of the entire building – but that’s for another day 😉. Sometimes it’s fun to manipulate images to deliver on an idea. In the capture above I combined two doors which were physically quite close to each other into a single image. It seemed to me that the doors had been nearly identical until a passing street artist decided to add some individual flare 😊. Do you suppose it was the same artist? Did the owner(s) appreciate or resent the paintings? Did you, the viewer, think this was a single panorama or did you sense the combination. Do you think it works or would the single images have been better left alone? Did you have to pause for a moment to think about it? Isn’t that part of our goal – to cause others to pause and think about an image and our intent in creating it? Sometimes we create an image simply to capture beauty. 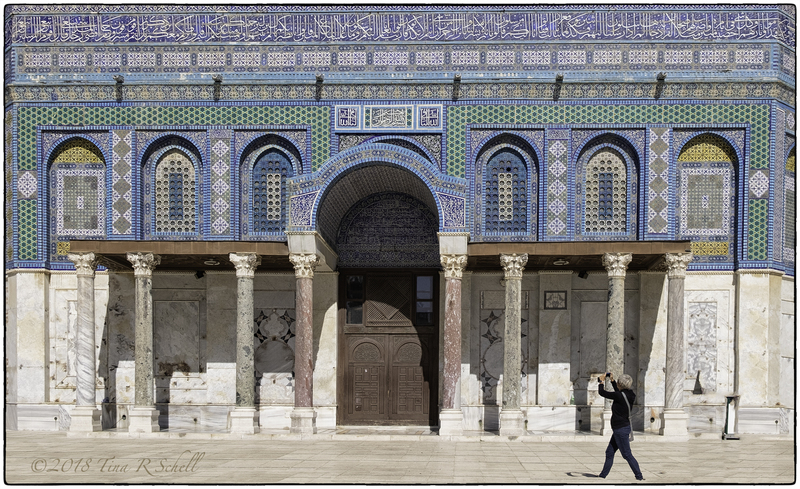 The image above, of one of the doorways into the Dome of the Rock, is exactly that. 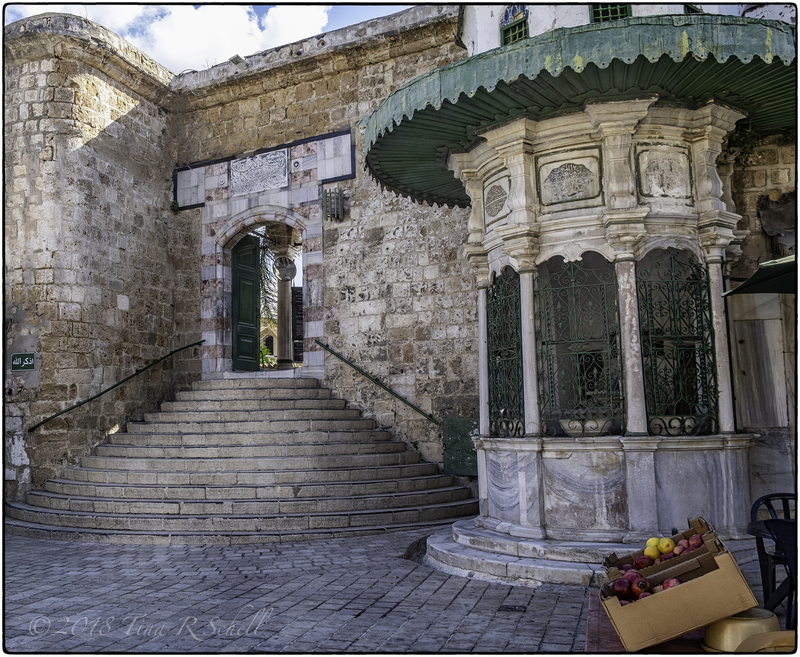 It is one of Israel’s holiest places to Muslims, Christians and Jews alike, and has been declared a UNESCO World Heritage site. I was drawn not only to the beauty and spirituality of the site, but also to the political controversy surrounding its accessibility. Finally, no post about doorways in the Middle East would be complete without one of their incredible antiquities, in this case an arched doorway in Caesarea. Originally built by Herod the Great in 20 BC the city ruins are remarkably well-preserved and are now part of an Israeli National Park. I have always been interested in archeology and the stories these kinds of ruins tell us about life so long ago. I made this image in recognition of my own sense of wonder and in the hopes that you too might give the long-ago history a moment’s thought. More on the many sites like this one in future posts. Thanks for staying with me as I meandered through so many doorways this week – I look forward to seeing your responses! Please remember the Lens-Artists tag to be seen in our Reader section, and feel free to link your post to this one as well. For more information about our challenge click here. And don’t forget to join Patti for her challenge next week. Steve of TheOutershores introduced us to a new word (and creature) “pollicipes” shown in the beautiful morning light. Deb of Twenty-four showed us what happens when water meets the treeline in a beautiful sunset. Ana of Anvica’s Gallery showed us it’s actually possible to touch the sun. Wishing everyone a great week, and a Happy Thanksgiving to all who celebrate. Thanks BB, glad you jumped in! Hardly! Terrific choices this week Sue! Petra looks awesome and immense! It is both Aixa, astonishing really! But I said thanks for all the beauty and the great idea. I have loved seeing all the beautiful and magical doors for this post. Thanks for a great topic. Mine is about a different kind of magic I guess. Amazing how the mind can just wander off………..
Lovely post, Tina. Petra is my favorite. Excellent subject, images and food for thought. I’ll do my door compilation on Thursday to combine with the Thursday Doors challenge since I’m travelling this week and won’t be posting other than this once. Just perfect for me, thank you! Sounds like a good plan MM—see you then, thanks! All pictures have their own beauty. Sometimes you need to have a closer look and you need more time to explore it. So I go definitely with Confucius. For me it’s important which part in the scene impress me so much that I have to take a photo. But I try to avoid to assess everything I see. Not easy. Why does something always have to be b e t t e r than something else? Perhaps something touches my heart more than another thing. You know what I mean? By the way I love the first picture 😉: A harmonic chaos that tells a story… Great! Understand completely – simply the “nature of the beast”! Thanks Fotohabitate! These are excellent captures Tina. STAIRWAY TO A DOORWAY and Glimpse of glory are my favourites. 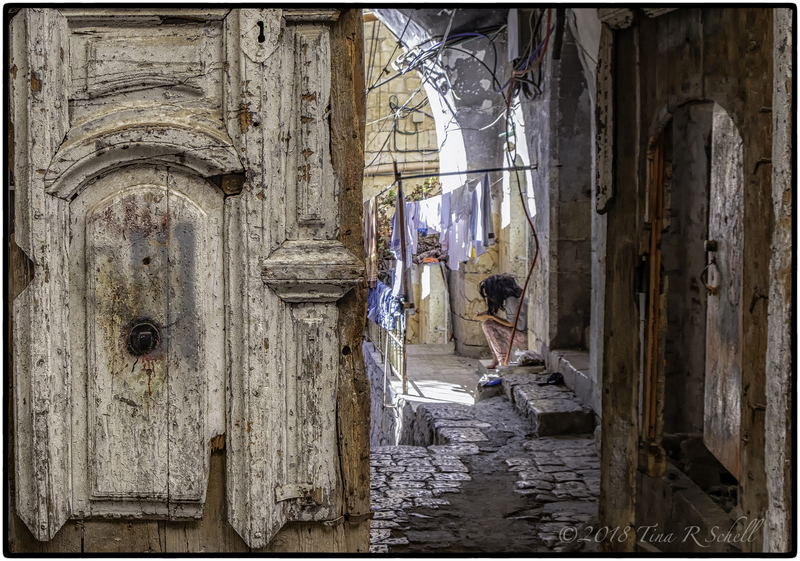 But purely from a writing perspective I would be able to write a post about LAUNDRY DAY, JERUSALEM comparing among other things the “technology” of the battered door with the almost unseen by us but absorbing the total focus of the laundry lady, the mobile phone. The title would be: a question of focus and your opening paragraph would fit in nicely in all of that. Thanks Abrie, glad you enjoyed those. Interesting idea about ‘focus’ which would, indeed, have worked!! Another thoughtful post, Tina. I’m looking forward to wrapping myself around the challenge! 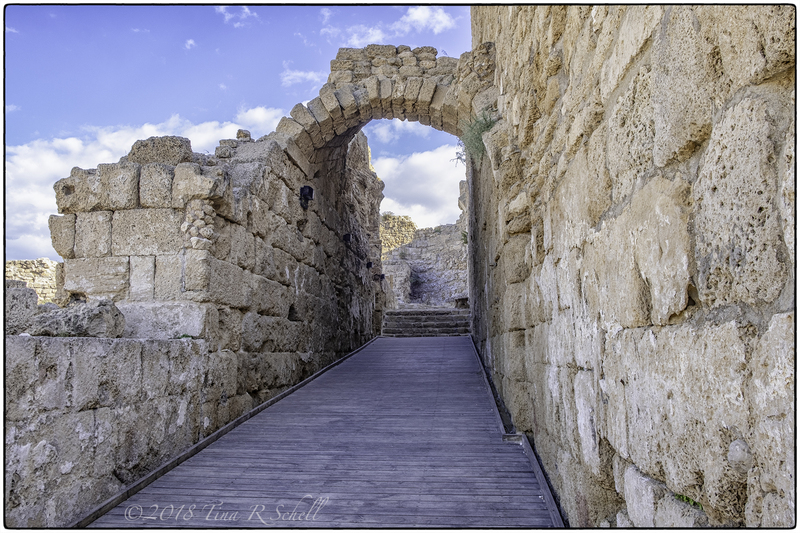 Having been there and seen this view, I really loved DOORWAY TO THE SKY, CAESAREA! Thanks Laurel- it’s quite something isn’t it?! Great subject for a challenge and wonderful photos! hi tina, wonderful and interesting photos to the theme, I like the 1st, 2nd, 4th and the 5th especially, here is my contribution for that week, https://wp.me/p2AvI7-2Wd. Glorious, Tina. All of them. That first shot, Laundry Day, I return to again and again. Superb quote as well. Once again – glorious. What an interesting theme and your selection of images is awesome. Ah! Petra is on my bucket list for quite some time. A fascinating collection of doors. And an interesting challenge! Thanks MM, look forward to your response! I’ve seen these places (other than Petra, where I’ve not been) first hand and I know the magic the ancient stones and doorways (and the Bahai Gardens, not so ancient, but glorious) hold. Thank you for sharing these gateways to history, culture, and places that hold so much of the world’s history in their hands besides. Sharing another place of cultural significance below … taken on a family trip to Thailand this summer. Great photos! I love the Alley Girl and your perspective on Petra. Thanks Sue!she does seem like quite an enigma! I think the girl in the first shot left the door open for her friend whom she was texting. I thought the two doors were one; the first door was strong enough to stand on its own, but the second door needed a friend. As far as the age of these structures, why can’t we build things to last that long now? Good question Sharon! And you’re right, she’s of an age that she probably WAS texting!! These are portals beyond my imagination, Tina. I am speechless. Your photos and your narratives are explosive. A threshold…. I loved seeing your Middle Eastern doorways. Spectacular shots, Tina. 🙂 I have returned to the image of Petra several times already! You really convey a sense of mystery in each of these shots. Beautiful! I can’t wait to see more from your trip. Thanks so much Patti, glad you appreciated these. Where are you off to now?? Many wonderful scenes you captured on your trip, Tina. Your image of Petra is gorgeous and Doorway has terrific clarity and colors. Glad you had a great trip. My favorite is the ‘Gate way to the Sea’.